Sola Sisters: Should Christians Pay Any Attention To The Blood Moons Talk? Should Christians Pay Any Attention To The Blood Moons Talk? For those who don't know what the blood moon chatter is all about, or have maybe heard something about it but don't know what it is, writer John Hagee has recently published a book which purports to have scientific evidence that there will be four lunar events which Hagee claims are known biblically (and prophetically) as "blood moons." These blood moons, Hagee claims, herald the beginning of the End Times. This teaching has inexplicably gone viral, with USA Today and CNN picking up the story, and #FourBloodMoons becoming one of the hottest trending topics on Twitter and Facebook. Even I got on Twitter and posted about it, and I never get on Twitter. Merciful heavens. Christians, get hold of yourselves! The blood moons thing has been debunked. Thoroughly. Several times! 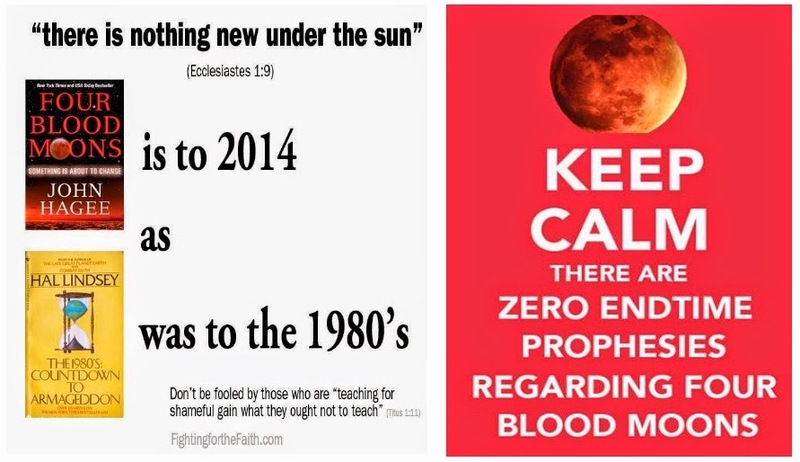 As pastor and Christian apologist Chris Rosebrough recently noted in a couple of clever memes, the Four Blood Moons thing is absolute bunk, and is to 2014 what Hal Lindsey's Countdown to Armageddon was to the 1980s. Rosebrough has also done two excellent radio programs (linked below) devoted to debunking the blood moon nonsense that has been whipped up by John Hagee and Mark Blitz of El Shaddai Ministries. (El Shaddai is a ministry that is part of the Hebrew Roots movement, a dangerous movement with cult-like overtone which we recently wrote about......that article can be read here). If John Hagee and Mark Blitz of El Shaddai were being honest, they would have to label this blood moons non-event "Four Regular Lunar Events That Signify Nothing." But that really doesn't have quite the same ring to it, does it? More resources below.....please feel free to forward them or apply as needed.